Clients often experience anxiety as their body responds to danger – whether real or imagined. And for some of our clients, when anxiety revs up, slowing it back down can take on a sense of emergency. So what exactly is it that often keeps people from soothing anxiety once it begins to take hold? According to Linda Graham, LMFT, it’s that they don’t know that they can. Not only that, they don’t know how. In the video below, Linda takes us through four specific ways to help clients calm anxiety. Take a look – it’s about 5 minutes. This video was taken from the Next Level Practitioner training program where members receive a daily video full of practical insights from one of the top 25 experts in our field. That program is not open for new members right now, but if you want to be on a waiting list in case it opens up, please click here. What tools do you use to help clients work through anxiety? Please leave a comment below. 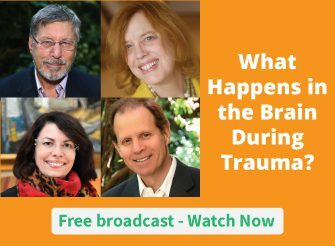 I explain how the stress response of anxiety relates to past trauma, often developmental, in order to normalize their reaction. I teach them to use compassionate self-talk. Sensational! Thank you, Ruth. I can not wait until the Summit. Blessed your heart. Love all the comments above, I use grounding action and breathing. I have the client stand up feet a part, i ask them to feel the weight of their body through their feet, then as they take a breath in they raise their arms slowly to shoulder height, so arms in straight line, then on out breath slowly lower their arms down. We do this several times, it is very relaxing, I sometimes do it myself after a heavy session. Help the client also to learn how to breath from their diaphragm is helpful. I thought Linda’s suggestions were helpful and spot on. I’ve worked with anxiety for over 20yrs both as a therapist and in my own struggles. One notion I’ve come to realize that reminds me of what Linda is saying is that I have often wondered if anxiety is the body’s response when it is transitioning from Sympathetic to Parasympathetic Nervous System. To me anxiety in the body feels like pushing on the gas when your foot is on the brake and I’m wondering if that is similar to the body trying to balance going from getting motivated (SNS) to rest and digest (PNS) or visa versa. Just putting it into physiological terms has helped me and my clients adjust without adding alarm to the shift. Brillant. Very clear with a first aid quality which I valued for myself. Thank you for the videos. I use guided meditation of a safe place. I start it off with the focus on the breath where I get them to visualise a champagne bottle inside them with the base of the bottle in their stomach. With every breath they have to visualise the air filling the base of the bottle. This helps not only to breathe correctly but reduces the anxiety very quickly. Yes to all the above. I ask the client to tell me where the anxiety is. Once I got into this, I realized I have not yet seen an emotion that isn’t palpable in the body. I am a fan of “Metaphors in Mind”, so I develop that physical sensation and invite it to show up as a healing metaphor. The anxiety tends to dissolve, especially when EFT plays a part. It’s more complex than that in practice, but that’s the general idea, and wow is it incredible. I have been utilizing guided meditation as a tool set for calming the body. So far it has assisted my clients in calming the body.